The rumour mill loves an Apple story. It doesn't matter if it's so far fetched it will never see the light of day, or whether it is something that might actually happen, it churns them all out anyway. With the iPhone 7 and iPhone 7 Plus having both launched nearly a year ago, all heads have turned to the next iPhones. This year's models will mark a decade since the launch of the original iPhone so you can only imagine how much of a twist the mill is getting its knickers in. Here is everything that has been speculated about the 2017 iPhones so far. Remember to take everything with a pinch of salt because as usual, nothing apart from the release date has been confirmed, nor will it be for another couple of weeks. Traditionally, the next iPhones should be called the iPhone 7S and iPhone 7S Plus, which is exactly what Apple's Taiwan suppliers suggest will be the case with only one element changing: the processor. Many of the rumours point towards three phones though: a iPhone 7S, 7S Plus and a third model, which up until recently was going by the name of the iPhone 8. Fast Company supports the claim of three iPhones this year, as does Bloomberg's Mark Gurman, both suggesting the same naming conventions of iPhone 7S, 7S Plus and iPhone 8. The iPhone 8 is rumoured to sit at the top of the range. It has also been called the iPhone X, which would also make sense given this is 10 in Roman numerals. More recently however, a report from 9to5Mac claims the 2017 iPhones will be called iPhone 8, iPhone 8 Plus and iPhone Edition. It is thought the iPhone 8 and iPhone 8 Plus refer to the previously rumoured iPhone 7S and 7S Plus, while the iPhone Edition refers to the iPhone 8 and iPhone X.
Apple has confirmed it will unveil the new iPhone models on 12 September in an official media invite. As for when the new iPhone models will be available to order, a previous leak shows Apple Black Out days, which is when AppleCare staff apparently cannot take time off, between 17 September and 4 November. This could suggest the new devices will go on sale on 18 September, as 17 September is a Sunday, and therefore the company needs all hands on deck to deal with increased call volumes. Recent reports suggested a date of 15 September for the announcement, so with a 12 September announcement now confirmed, it is likely pre-orders will start on 15 September, with device in stores from 22 September. In terms of price, it has been suggested the mystery third model will come with a premium price tag, with talk of $1000. Ouch. There have also been a couple of reports claiming the iPhone 8, or iPhone Edition as it is now being referred to, might be delayed until October or November due to technical issues with the OLED screen so nothing is set in stone as yet, though it is still expected to be unveiled the same time as the other devices. Premium ceramic model for 10th anniversary? An all-glass design has been thrown about the speculation field for the iPhone Edition and more recently, the iPhone 7S Plus (now known as the 8 Plus) too. Glass would at least allow for wireless charging, a feature that has also been rumoured for the next iPhones. 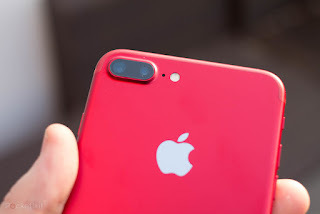 Leakster Sonny Dickson published a couple of photos of a dummy device he claims is the iPhone 7S Plus (iPhone 8 Plus). The images show a horizontal dual-rear camera, like the current iPhone 7 Plus offers, but rather than aluminium, the dummy model appears to have a glass back, suggesting wireless charging may finally appear. There has also been talk of a switch from an aluminium construction to stainless steel though, something Bloomberg also suggests, so it is currently unclear what material the next iPhones might use. For example, we also wouldn't be surprised to see a premium ceramic finish for the 10th anniversary iPhone. Apple used the material for its Series 2 Apple Watch Edition model and OnePlus also used ceramic as a finish for its X device. It could be that Apple launched the Jet Black iPhone last year as a test bed to see how people took to a glossy device, with the aim to introduce a more premium option this year. AppleInsider published some images from the Twitter account of Benjamin Geskin who claims the iPhone 8 will come in four colours, one of which will be new, which suggests a couple of the iPhone 7's finishes will be scrapped. 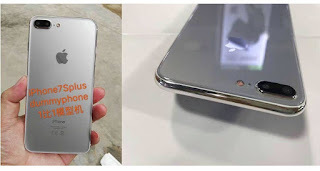 Geskin accompanied the tweet with some images of a mirrored-like device but didn't specify what the new finish might be other than it could be reflective. It's also been claimed the iPhone 8 won't be available in white. The Wall Street Journal reported the 2017 iPhone will look totally different to the iPhone 7. Apparently the Touch ID fingerprint sensor will be built into the display because Apple's design chief, Jony Ive, wants the iPhone to look like "a single sheet of glass". According to Bloomberg sources, this might be achieved by putting glass on the front and back with a thin steel frame in the middle. This idea has been supported by a report from the Economic Daily News, who said sources responsible for the A11 chip have said this will be the case. It's been suggested the embedded scanner might only appear on one model though. Some photos published to Reddit also support the idea of an embedded fingerprint sensor, showing what is claimed to be the front and rear panel of the iPhone 8, or iPhone Edition now, with the front only offering a cut out for the speaker and front camera sensor at the top and no sign of Touch ID. This form factor is further supported by an image tweeted by developer Guilherme Rambo, as well as some images on Weibo that not only show the purported front panel of the iPhone Edition but some of its innards too. Other supporting leaks for the fingerprint sensor being built into the display include a dummy model revealed in a video that shows no cut out for Touch ID and no fingerprint sensor on the rear, analyst Ming-Chi Kuo who says there will be no physical home button and no Touch ID, with Apple opting for 3D facial recognition for biometric security instead, which is an idea a recent report from The Wall Street Journal also confirms, while another report which suggests Touch ID could be placed within the power button. There has also been a leak of apparent rear panels that suggest Apple might put Touch ID on the rear of the device so ultimately, currently no one knows what will happen to Touch ID if Apple opts for an all-screen front. Bloomberg has also supported the idea of facial recognition though, reporting that sources familiar with the product have said a front-facing camera will include a 3D depth-sensing module to unlock the phone and authenticate payments. The sources did say this may not appear on the 2017 iPhone, but the most recent Wall Street Journal report suggests it will. The front-facing 3D sensor also popped up in a separate report from developer Guilherme Rambo who combed through the Apple HomePod code that leaked. He's claimed the sensor could be used to pinpoint whether the phone is being actively used and if it is, silence your notifications automatically. Rambo also claimed the sensor, which is apparently codenamed Pearl ID, will allow for multiple face recognition, facial recognition for Apple Pay payments and it ill apparently support third party apps. We'd expect the headphone jack to remain missing and we'd also expect a dual-lens set up on the rear of at least one of the devices, something that has been supported with a recent schematic from Sonny Dickson, showing a vertical camera array. Dickson's drawing also shows what appears to be the fingerprint sensor on the rear, which would see Apple doing what Samsung did. There have also been some images of what is claimed to be a mockup iPhone Edition published on BGR. These images show a vertical dual camera on the rear, along with no physical home button, what appears to be glass on both the back and front and a thicker frame than the current models. There is no headphone jack, as expected, with speaker grilles either side of the Lightning port. It's just a mock up though so don't get too excited, though it does appear to be similar to the Reddit image leaks, the dummy video and some leaked drawings from @VenyaGeskin1. The drawings claim to show both the final designs for the iPhone 8, or iPhone Edition, and the iPhone 7S Plus, or iPhone 8 Plus. The iPhone Edition image appears to show a vertical dual camera array, again, no headphone jack and no home button on the front. The iPhone 8 Plus drawing appears to offer a horizontal dual camera, as the iPhone 7 Plus currently does, and again, no home button appears to be present. The drawings from @VenyaGeskin1 show the iPhone 8/iPhone Edition as measuring 143.4 x 70.77 x 7.5mm, which is slightly bigger and thicker than the current iPhone 7, but smaller than the iPhone 7 Plus. Additionally, an image showing three metal casings appeared on Chinese social media site Weibo, claiming to present the iPhone 7S Plus (iPhone 8 Plus), iPhone 8 (iPhone Edition) and iPhone 7S side-by-side in order to show the size variation. Based on the image, the iPhone Edition will sit in the middle of the iPhone 8 Plus and the iPhone 7S in terms of size and it will have a vertical dual camera on the rear, as we have seen in other leaks. We'd expect the Apple iPhone 8 and iPhone 8 Plus to stick with the 4.7-inch and 5.5-inch screen sizes, as to go smaller would encroach on the iPhone SE's territory and well, much larger would basically put the iPhone in iPad mini land, almost. It wouldn't be surprising to see the same size devices but with larger screens though, as Samsung and LG both did with their recent flagship smartphones. As we said, there has been talk of a third iPhone, which was originally thought to be 5.5-inches too, though there has been a rumour of 5-inches, as well as 5.8-inches. The leaked drawings from @VenyaGeskin1 suggest a 5.8-inch display with very narrow bezels into a footprint only slightly larger than the current iPhone 7. Analyst Ming-Chi Kuo of KGI Securities claims the third device, or iPhone Edition, will have a redesigned OLED display, while the others, the iPhone 8 and 8 Plus, will have an LCD display, with rumours suggesting it might not be till 2019 till all iPhones offer OLED. This is supported by a report from BGR that claimed only one of three 2017 devices will have an OLED display. Apparently OLED screen supply won't be able to meet Apple's requirements so the other two devices are said to be launching with LCD displays. The Korean Herald begs to differ however, suggesting all three iPhones will have Samsung-made curved plastic OLED displays. The Wall Street Journal also claims Ive is considering a curved, edge-to-edge OLED screen for the 2017 iPhone, as does Bloomberg. Bloomberg also claims sources say the display will cover the entire front of the device, like the recent Galaxy S8. This suggests the home button could be placed into the display, which is something a leaked schematic drawing alludes to, the Economic Daily Times report also suggests and the leaked images on Reddit and the dummy video claim. The drawing suggests there will be an edge-to-edge flat display with 2.57mm bezels. Analyst Kuo has said the iPhone Edition will offer "the highest screen-to-body ratio of any smartphone currently available worldwide", though as you may recall we mentioned above he also claims there will be no Touch ID built into the display as the full screen design doesn't work with the existing technology and apparently the scan through ability of the embedded fingerprint sensor is still seeing technical challenges. No doubt 3D Touch will be included again in this year's devices in some form, probably more advanced than it is currently and we'd also love to see Apple Pencil compatibility, at least on the Plus model. The Investor has claimed Samsung Display is developing a pressure-sensitive OLED touch display for the iPhone 8, suggesting 3D Touch will indeed be on board. It is also thought Apple's True Tone display, found on the iPad Pro range, will appear on the iPhone Edition and Bloomberg has also claimed Apple is working on displays with higher frame rates for future iPhone models, like the ProMotion displays found in the latest iPads. Will Apple up the display resolution for the iPhone 8 models? Who knows. A 2K AMOLED display was reported for the iPhone 7 and iPhone 7 Plus, but it never appeared so perhaps Apple was holding out for the iPhone 8 and iPhone 8 Plus, or the iPhone Edition if Kuo's and BGR's predictions are accurate. A Quad HD resolution on a 5.5-inch display would put the pixel density at 534ppi, compared to the iPhone 7 Plus's current 401ppi, while the smaller model would offer 635ppi, compared to 326ppi. A switch to AMOLED would also deliver a greater contrast ratio for brighter, punchier colours. Apple's iPhone 7 and 7 Plus both offer great camera capabilities, like the iPhones that have gone before them. The iPhone 7 has a 12-megapixel rear snapper, while the iPhone 7 Plus has a dual camera setup with two 12-megapixel snappers, one wide angle and the other telephoto. Both devices have a f/1.8 aperture, along with optical image stabilisation and a quad-LED True Tone flash. The front camera is 7-megapixels on both devices with an aperture of f/2.2. We'd like to see all the new iPhone models offering the same capabilities so a dual-setup on the both, or all three options would be welcomed. After all, opting for the smaller smartphone shouldn't mean losing out on some of the fun features. Smaller hands want to be able to create bokeh images too. That said, analyst Kuo believes the two larger phones predicted for 2017 will feature the dual-lens camera setup, while the smaller device will miss out, again. Another rumour contradicts this however, claiming a new 5-inch model will feature a dual-camera arrangement but in a vertical format rather than horizontal as it is now. The same analyst also suggests the iPhone Edition will feature a "revolutionary" new front-facing camera that will be capable of facial or iris recognition. He believes Apple Pay would then use one of these security methods, over the fingerprint, which matches his previous claims of no physical button on the new device(s). Samsung offers iris recognition on its latest devices, and facial recognition isn't new either, but whether Apple will jump on the bandwagon is something else entirely. According to Bloomberg, the iPhone Edition will offer "more advanced cameras" so we can expect improvements somewhere, it is just not clear in what form as yet. The new devices will no doubt come with a new processor, which if tradition dictates should be called the A11 Fusion with an embedded M11 motion coprocessor. It has been claimed the iPhone Edition may come with a chip dedicated to handling specific tasks, like image recognition and typing suggestions, meaning less pressure on the battery. Bloomberg also said its sources, who call the chip Apple Neural Engine, said the chip might not come this year. We'd also expect the same storage models as the current iPhone 7 and iPhone 7 Plus, meaning 32GB, 128GB and 256GB, as well as the same colour options. Of course, we'd love to see a bigger battery as always and it wouldn't be too surprising to see the Smart Connector introduced to the next iPhone, allowing for the transfer of both data and power at the same time. According to the Wall Street Journal, the next iPhone will come with a "USB-C port for the power cord and other peripheral devices instead of the company's original Lightning connector." That suggests Apple could ditch the Lightning connector, though this seems unlikely. Analyst Kuo suggests Apple will add USB Type-C to one end go the iPhone's power cord, replacing the current USB 3.0, which seems like a more plausible suggestion. As we mentioned though, wireless charging has been speculated after it was reported that iPhone manufacturer Foxconn is working on a new system. Apparently it will only be implemented if the yield rate can be deemed profitable though, and it's also been claimed the technology might only appear on the larger iPhone. Manufacturer Wistron, who makes the iPhone SE, also mentioned the next generation iPhone models will include wireless technology, though it is not clear if this will be the 2017 models. Another report, also talking about wireless charging, has suggested the iPhone would be able to be charged from a distance of up to 15ft however. This is a technology being developed by Energous and there have been signs to suggest it is working with Apple, though no confirmation as yet. It is also reported that waterproofing will improve for the next models. The current iPhone 7 and iPhone 7 Plus offer an IP67 rating, while the likes of Samsung and Sony both offer IP68. Water and dust IP ratings: What do they actually mean? Apple always launches its new iPhones with the latest software build, which for the iPhone 8, 8 Plus and iPhone Edition will be iOS 11, assuming they all arrive. Apple previewed some features of the new build at its developer conference in June, including updates to Maps, Control Centre and Siri. There were also some big advancements in AR revealed, as well as CarPlay and the App Store is also set to get a whole new look. You can read all about the features coming in September in our separate feature. Nothing is certain at the moment, except for the fact that Apple will launch a new iPhone, or iPhones, on 12 September this year and these models will mark a decade since the original iPhone. Whether the anniversary will mean a whole new design for the iPhone is not yet known, but we can expect it to offer power enhancements and iOS 11 at the very least. We wouldn't be surprised to see a standard and Plus model again, as well perhaps a premium, or special edition anniversary model or finish that we think will be ceramic. For now, keep checking back as we will update this feature whenever we see a new rumour appear or a new leak. It's welcomed, whether 8 or X or 7S.